Skin-Age Solution Body Cream is a cream that keeps skin smooth and silky. 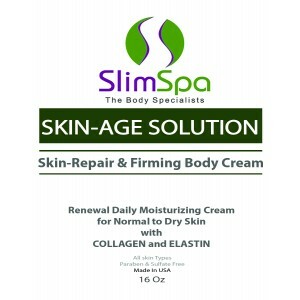 Anti-Aging & Firming Body Cream with COLLAGEN, ELASTIN and SHEA BUTTER. Skin-Age Solution Body Cream is a cream that keeps skin smooth and silky. Marine Collagen is a protein that comes from the skin or scales saltwater fish such as cod and salmon. It has an extensive medical use in the Far East. This type of collagen is appreciated in the western market for its properties that help fighting the effects of aging and repair damage caused by the environment, such as UV rays. It is also highly valued as an ingredient in cosmetics for its moisturizing and nourishing effect on the skin cells. MAINTAIN A SMOOTH AND SILKY SKIN! 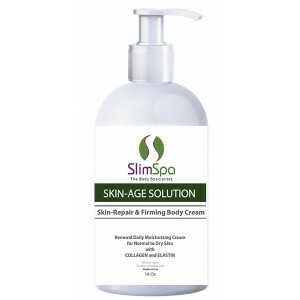 Skin-Age Solution Body Cream is a cream that keeps skin smooth and silky. Marine Collagen is a protein that comes from the skin or scales saltwater fish such as cod and salmon. It has an extensive medical use in the Far East. This type of collagen is appreciated in the western market for its properties that help fighting the effects of aging and repair damage caused by the environment, such as UV rays. It is also highly valued as an ingredient in cosmetics for its moisturizing and nourishing effect on the skin cells. Skin-Repair and Firming Body Cream. Provides 24-hour hydration and helps restore the protective skin barrier. MAINTAIN SKIN HEALTH – This fine mist is used to rehydrate after being exposed to the sun all day long, Helps and provides sunburn relief, however it also prevents peeling. Use it as an after shave as it works better than anything else we've tried in calming down irritated skin. 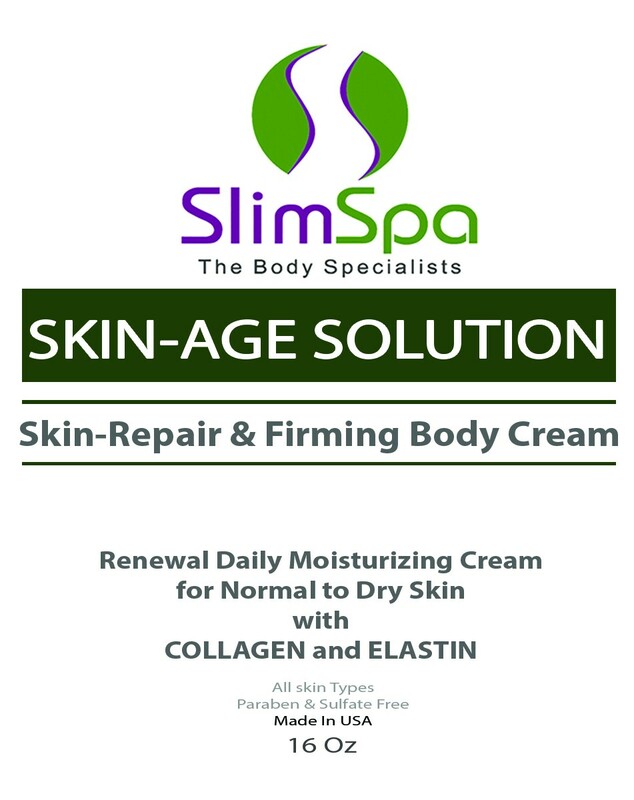 Skin-Age Solution Body Cream for Normal to Dry Skin. Can be used for skin problems such as atopic dermatitis (eczema), psoriasis, ichthyosis, winter itch. REPLENISHES AND NOURISHES SKIN – Contains special ingredients like Shea Butter, Collagen and Elastin, to replenish and nourish your skin. Formulated with Collagen and Elastin to help retain skin's natural moisture. Used as a night cream, for massage, and as a daily moisturizing cream for face, hands, and body. HYDRATING SKIN MOISTURIZER – Great for women to moisturize skin daily and especially for men who are lazy and far to hairy to bother with smearing cream on their arms and legs. Kids love it too! Help soothe and hydrate dry, rough, itchy or irritated skin on contact. Can be used to help with eczema, psoriasis, sun burns and other rashes. INTENSE MOISTURIZER – Helps to fight the effects of all seasons, especially the dry winter or summer, by providing concentrated moisture. POWERFUL ANTI-AGING FORMULA - Delicate formula can be used on BODY to help fight the signs of aging. Anti-aging cream also can be used as an everyday body moisturizer. Great for people with dry or sensitive skin. Ensures your skin stay hydrated, firm and radiant by balancing its moisture and collagen. A non-greasy, long-lasting moisturizing cream that is easy to spread, quickly absorbed and non-comedogenic (does not cause blackheads). Available with a convenient pump dispenser for multi-users. Apply twice a day: morning and night. For best results use after a shower or a bath, when your skin is still slightly damp. Pump cream into your hand and then use your other hand to gently rub it in to the skin of your body, and any areas that can be prone to dryness, including your legs, elbows, knees and feet. Massage gently using a downward and upward motion. Apply a thick layer and allow it to sink into your skin for 30 seconds before getting dressed. Purify water, Paraffinum Liquidum, Hexadecanol, Sorbitol, Cyclomethicone, Triethanolamine, Marine Collagen, Elastin, Shea Butter, Fragrance , Sodium Chloride, EDTA, Methylchloroisothiazolinoine, Methylisothiazolinoine.